In November, we presented for you a quick way to download The Complete Sherlock Holmes -- not knowing that, a few months later, a lost Sherlock Holmes story, seemingly attributed to Arthur Conan Doyle, would be discovered in an attic in Scotland. The story, The Guardian writes, was "part of a pamphlet printed in 1903 to raise money to restore a bridge in the Scottish border town of Selkirk." Discovered by the historian Walter Elliot, the tale entitled "Sherlock Holmes: Discovering the Border Burghs and, By Deduction, the Brig Bazaar" can be read below, thanks to Vulture. 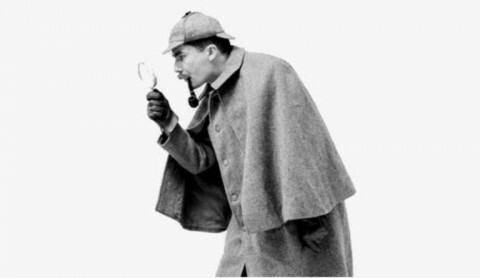 In 2013, a US judge ruled that Sherlock Holmes stories now belonged in the public domain. The same would appear to hold true for this happily discovered, 1300-word story. You can find more Sherlock Holmes stories in our collection of Free eBooks. "Sherlock Holmes: Discovering the Border Burghs and, By Deduction, the Brig Bazaar"
We've had enough of old romancists and the men of travel" said the Editor, as he blue-pencilled his copy, and made arrangements for the great Saturday edition of the Bazaar Book. "We want something up-to-date. Why not have a word from 'Sherlock Holmes?'" Editors have only to speak and it is done, at least, they think so. "Sherlock Holmes!" As well talk of interviewing the Man in the Moon. But it does not do to tell Editors all that you think. I had no objections whatever, I assured the Editor, to buttonhole "Sherlock Holmes," but to do so I should have to go to London. "London!" scornfully sniffed the Great Man. "And you profess to be a journalist? Have you never heard of the telegraph, the telephone, or the phonograh? Go to London! And are you not aware that all journalists are supposed to be qualified members of the Institute of Fiction, and to be qualified to make use of the Faculty of Imagination? By the use of the latter men have been interviewed, who were hundreds of miles away; some have been 'interviewed' without either knowledge or consent. See that you have a topical article ready for the press for Saturday. Good day." I was dismissed and had to find copy by hook or by crook. Well, the Faculty of Imagination might be worth a trial. "And when shall I see you again, Watson? The inquiry into the 'Mysteries of the Secret Cabinet' will be continued in Edinburgh on Saturday. Do you mind a run down to Scotland? You would get some capital data which you might turn to good account later." "I am very sorry," replied Dr Watson, "I should have liked to have gone with you, but a prior engagement prevents me. I will, however, have the pleasure of being in kindly Scottish company that day. I, also, am going to Scotland." "Ah! Then you are going to the Border country at that time?" "My dear Watson, it's all a matter of deduction." "Well, when a man becomes absorbed in a certain theme, the murder will out some day. In many discussions you and I have on the fiscal question from time to time I have not failed to notice that you have taken up an attitude antagonistic to a certain school of thought, and on several occasions you have commented on the passing of "so-called' reforms, as you describe them, which you say were not the result of a spontaneous movement from or by the people, but solely due to the pressure of the Manchester School of politicians appealing to the mob. One of these allusions you made a peculiar reference to 'Huz an' Mainchester' who had 'turned the world upside down.' The word 'Huz' stuck to me, but after consulting many authors without learning anything as to the source of the word, I one day in reading a provincial paper noticed the same expression, which the writer said was descriptive of the way Hawick people looked at the progress of Reform. 'Huz an' Mainchester' led the way. So, thought I, Watson has a knowledge of Hawick. I was still further confirmed in this idea by hearing you in several absent moments crooning a weird song of the Norwegian God Thor. Again I made enquires, and writing to a friend in the South country I procured a copy of 'Teribus.' So, I reasoned, so — there's something in the air! What attraction has Hawick for Watson?" "Wonderful," Watson said, "and —"
"Yes, and when you characterised the action of the German Government in seeking to hamper Canadian trade by raising her tariff wall against her, as a case of 'Sour Plums,' and again in a drawing room asked a mutual lady friend to sing you that fine old song, 'Braw, braw lads,' I was curious enough to look up the old ballad, and finding it had reference to a small town near to Hawick, I began to see a ray of daylight. Hawick had a place in your mind; likewise so had Galashiels — so much was apparent. The question to be decided was why?" "So far so good. And—"
"Later still the plot deepened. Why, when I was retailing to you the steps that led up to the arrest of the Norwood builder by the impression of his thumb, I found a very great surprise that you were not listening at all to my reasoning, but were lilting a very sweet - a very sweet tune, Watson - 'The Flowers of the Forest;' then I in turn consulted an authority on the subject, and found that that lovely if tragic song had a special reference to Selkirk. And you remember, Watson, how very enthusiastic you grew all of a sudden on the subject of Common-Ridings, and how much you studied the history of James IV., with special reference to Flodden Field. All these things speak, Watson, to the orderly brain of a thinker. Hawick, Galashiels, and Selkirk. What did the combination mean? I felt I must solve the problem, Watson; so that night when you left me, after we had discussed the "Tragedy of a Divided House," I ordered in a ton of tobacco, wrapped my cloak about me, and spent the night in thought. When you came round in the morning the problem was solved. I could not on the accumulative evidence but come to the conclusion that you contemplated another Parliamentary contest. Watson, you have the Border Burghs in your eye!" "In my heart, Holmes," said Watson. "And where do you travel to on Saturday, Watson?" "I am going to Selkirk; I have an engagement there to open a Bazaar." "Is it in aide of a Bridge, Watson?" "Yes,' replied Watson in surprise; "but how do you know? I have never mentioned the matter to you." "By word, no; but by your action you have revealed the bent of your mind." With weeping and with laughter. Could I, being mortal, help thinking you were bent on some such exploit yourself?" "Well, goodbye, Watson; shall be glad of your company after Saturday. Remember Horatius' words when you go to Border Burghs: 'How can man die better than facing fearful odds.' But there, these words are only illustrations. Safe journey, and success to the Brig!" Scottish. Something found in Scotland would be Scottish, the country name is Scotland. It’s like saying that something found in America is United States of America. No way is this Sir Arthur Conan Doyle. No way in the world.